Classic Space is a theme introduced in 1987. Classic Space Minifigures featured the old visorless helmets, which were eventually phased out in favor of newer helmets with movable visors in 1987. Classic Space featured peaceful explorers, with no antagonistic groups. The larger flying craft of the Classic Space sets all featured a brick with their set number on it. There were 5 astronaut minifigures, blue, red, white, yellow and black. The initial introduction of the Space theme marks also the beginning of Classic Space. Some of the first Space sets in a catalog from 1979. The first LEGO Space sets were a leap forward in LEGO design. Compared to the LEGO Company's previous spaceflight-related sets (801 Space Rocket in 1964, 358 Rocket Base in 1973, and 565 Moon Landing in 1976), this new theme of sets boasted new parts and building techniques never before seen in LEGO sets. Although the theme used plenty of basic bricks, there were now parts with finer detail used in smoother-looking ships and multi-purpose vehicles. Despite curiosities such as steering wheels used to direct spacecraft, and often no inflight pilot protection other than a spacesuit (with a visorless helmet), simple new constructs sparked builders' imaginations. Starting with spaceships and basic wheeled vehicles, the theme developed, occasionally mirroring science fiction designs. As LEGO Space expanded, the basic pattern of ground-buggies, walking robots, small and large spaceships, and bases emerged. Early Space sets had a simplistically modern yet colourful charm unrivaled by any other mass-produced science-fiction toy of the time. Many of the theme's more specialized pieces had yet to be developed, although when Space was first introduced, many parts were new, or were older parts made in new colours. Examples of these early simple sets include 462 Rocket Launcher (1978), and 442 Space Shuttle, and 452 Mobile Tracking Station (both 1979). Perfectly suited for utilitarian LEGO Space, gray had finally become a major colour for a LEGO theme, especially as more plate-type parts were made in that colour, even before LEGO Castle whose first predominantly grey castles were not introduced until 1984. Most often, gray Space sets were paired with green windows, and the other predominant colour scheme was blue with yellow windows. With the introduction of the 6929 Starfleet Voyager in 1981, there were also classic spaceships that appeared in white, with blue canopies, albeit this new colour scheme didn't really catch on until the introduction of Futuron in 1987. The advent of this new theme sounded the bell for the end of the Classic Space era. New parts, most notably the new visored helmets, were introduced as well as a distinct looking adversary faction, but it also reprised several elements of Classic Space such as the coloured spacesuits and the concept of civilian space explorers, looking more like a visually updated continuation than a mere replacement. New sets in the style of Classic Space were still released until 1988, but those sets sported the Futuron colour scheme, although they still included the old minifigures with their visorless helmets. The statue of a Classic Space astronaut that appeared in 5974 Galactic Enforcer. The Classic Space logo later reappeared in sets of Futuron and Space Police I. It was also featured on several jackets of Town minifigures which first appeared in 4513 Grand Central Station from 2003. Similarly, a white Classic space astronaut with a jetpack was featured on a tourist's shirt in 8970 Robo Attack. The logo of the Mars Mission theme from 2007 seems to be inspired by the Classic Space logo. A minifigure statue included in 5974 Galactic Enforcer from 2009 resembles a Classic Space astronaut, although it does not feature a classic helmet but instead a normal one without visor. The Latin writing on the pedestal says "In annos triginta ad caelum infinitum construxit." ("In thirty years it built to the infinite sky"), commemorating the 30th anniversary of LEGO Space. 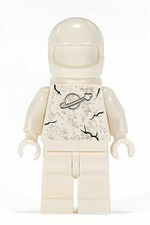 The Classic Space astronaut appeared in LEGO Battles as an unlockable hero unit. In Lego Universe, completing all the Crux Prime Achiever missions awards the player with a black Classic Space shirt. The Galaxy Patrol from 8831 Minifigures Series 7 has the Classic Space logo on its shoulder pads. In The LEGO Movie, there is a Blue Classic Spaceman, named Benny . 497 Galaxy Explorer (1979), 6929 Starfleet Voyager (1980), 6950 Mobile Rocket Transport (1982), 6980 Galaxy Commander (1983), and 6985 Cosmic Fleet Voyager (1986). 493 Space Command Center (1978), 483 Alpha-1 Rocket Base (1979), 6970 Beta-1 Command Base (1980), 6971 Intergalactic Command Base (1984), and 6972 Polaris-I Space Lab (1987). A remote-controlled Classic Space vehicle prototype from 1985. This page was last edited on 15 March 2016, at 18:57.